Induction of anaesthesia occasionally has been associated with undesirable behaviour in dogs. High quality of induction of anaesthesia with propofol has been well described while in contrast variable induction and recovery quality has been associated with diazepam-ketamine. In this study, anaesthetic induction and recovery characteristics of diazepam-ketamine combination with propofol alone were compared in dogs undergoing elective orchidectomy. Thirty-six healthy adult male dogs were used. After habitus scoring (simple descriptive scale [SDS]), the dogs were sedated with morphine and acepromazine. Forty minutes later a premedication score (SDS) was allocated and general anaesthesia was induced using a combination of diazepam-ketamine (Group D/K) or propofol (Group P) and maintained with isoflurane. Scores for the quality of induction, intubation and degree of myoclonus were allocated (SDS). Orchidectomy was performed after which recovery from anaesthesia was scored (SDS) and times to extubation and standing were recorded. Data were analysed using descriptive statistics and Kappa Reliability and Kendall Tau B tests. 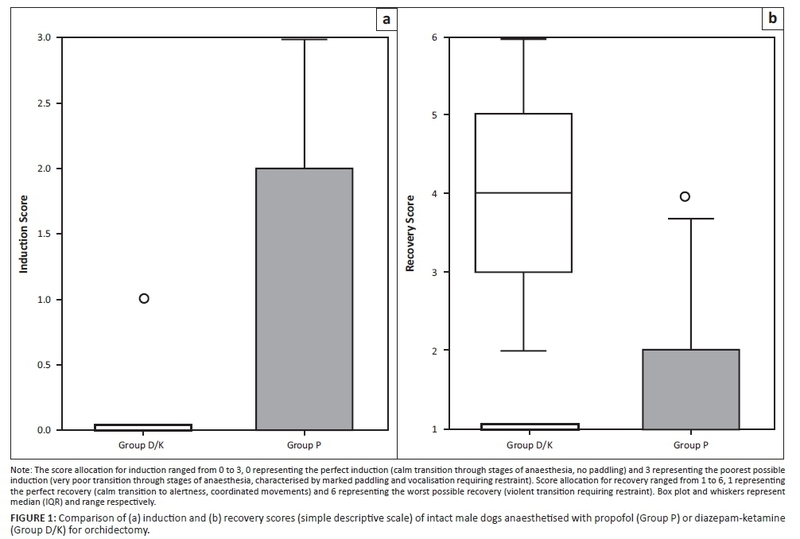 Both groups were associated with acceptable quality of induction and recovery from anaesthesia. Group P, however, was associated with a poorer quality of induction (p = 0.014), prolonged induction period (p = 0.0018) and more pronounced myoclonus (p = 0.003), but had better quality of recovery (p = 0.000002) and shorter recovery times (p = 0.035) compared with Group D/K. Diazepam-ketamine and propofol are associated with acceptable induction and recovery from anaesthesia. Propofol had inferior anaesthetic induction characteristics, but superior and quicker recovery from anaesthesia compared with diazepam-ketamine. The combination of diazepam and ketamine is a commonly described protocol for induction of general anaesthesia in healthy dogs of various ages. It may also be indicated in certain cases with cardiovascular compromise (Beteg et al. 2010; Boutureira, Trim & Cornell 2007; Fayyaz et al. 2009; Green et al. 1981; Haskins, Farver & Patz 1986; Hazra, De & Roy 2008; Hellyer, Freeman & Hubbell 1991; Kolata 1986; White, Shelton & Taylor 2001). The combination of diazepam and ketamine, at a dose range of 0.2 mg/kg - 0.5 mg/kg and 5 mg/kg - 10 mg/kg respectively, has generally been associated with excitement-free induction of anaesthesia in dogs. However, maintenance of pharyngeal and laryngeal reflexes as well as hypersalivation have resulted in difficult intubations being reported (Green et al. 1981; Hellyer et al. 1991; White et al. 2001). Recovery from diazepam-ketamine in dogs has been reported to be free of emergence excitation although it is commonly associated with ataxia (Beteg et al. 2010; White et al. 2001). Propofol (2, 6-di-isopropylphenol) has a wide initial dose range (2 mg/kg - 8 mg/kg) in dogs and induces rapid central nervous system depression facilitating anaesthetic induction within 20-30 seconds after commencement of intravenous administration (Robinson & Borer-Weir 2013; Watkins, Hall & Clarke 1987). Propofol bypasses the early stages of anaesthetic depth that are often associated with involuntary clonic movements, thereby facilitating routine excitement-free anaesthetic inductions in up to 92.5% of cases (Branson 2007; Davies 1991; Glowaski & Wetmore 1999). However, adverse induction behaviour characterised by paddling of limbs, muscle twitches and pain on injection has previously been associated with propofol administration in dogs (Davies 1991; Smith et al. 1993). Recovery from propofol is rapid and excitement free, with return to consciousness occurring approximately 20 minutes after bolus administration (Branson 2007). Poor recoveries from propofol are uncommon and are characterised by tremors, opisthotonus, excessive salivation and vomiting (Robertson, Johnston & Beemsterboer 1992; Smith et al. 1993). Diazepam-ketamine induction and recovery characteristics compared with propofol have not been reported previously. The aim of this prospective clinical study was to compare a diazepam-ketamine combination with propofol alone for anaesthetic induction and recovery. Thirty-six healthy male small-breed dogs weighing a mean (± s.d.) of 5.5 kg ± 2.3 kg and with a mean age of 26 ± 13 months were randomly assigned to an induction regimen of either diazepam-ketamine (Group D/K) or propofol (Group P). Dogs were declared healthy based on physiologically normal haematological (haematocrit, total serum protein, blood smear) and serum chemistry (blood urea nitrogen, serum creatinine) profiles and clinical examination performed upon admission to the hospital. Prior to anaesthesia, each dog was starved of food for 8-12 hours, then placed in a quiet, warm cage and left undisturbed for 30 minutes prior to being allocated a cage habitus score (simple descriptive score, SDS; Table 1) by the primary investigator. A pre-anaesthetic medication of acepromazine (ACP) (Neurotranq®, Virbac, South Africa) at 0.02 mg/kg and morphine (Morphine sulphate Fresenius PF, Fresenius Kabi, South Africa) at 0.3 mg/kg was then administered intramuscularly to all dogs, followed by allocation of a sedation score 40 minutes later (SDS; Table 1). Immediately after sedation scoring, a 22-gauge indwelling cannula (Jelco®, Smiths Medical, South Africa) was inserted into the right cephalic vein to facilitate intravenous administration of anaesthetic induction drugs. General anaesthesia was induced in Group-D/K dogs with an initial combination dose of diazepam (A-Lennon Diazepam 0.5%, Aspen Pharmacare, South Africa) and ketamine (Ketamine Fresenius 10%, Fresenius Kabi, South Africa) of 0.375 mg/kg and 5 mg/kg, respectively and in Group-P dogs with an initial propofol (Propofol Fresenius 1%, Fresenius Kabi, South Africa) dose of 2 mg/kg. Induction boli were administered over a 30-second period using a volumetric infusion pump (Perfusor®, B Braun, Germany). Sixty seconds after initiation of bolus administration, depth of anaesthesia was assessed by a co-investigator by orderly testing of the lateral and medial palpebral reflex, menace reflex and jaw tone. 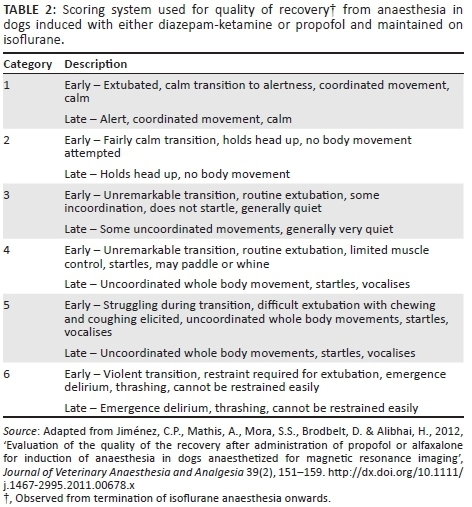 If depth of anaesthesia was deemed insufficient for endotracheal intubation, a follow-up intravenous bolus was administered, which in Group-D/K dogs was 0.175 mg/kg and 2.5 mg/kg of diazepam and ketamine, respectively and in Group-P dogs was 1 mg/kg of propofol over 30 seconds. Follow-up boli were administered until endotracheal intubation could be achieved. Endotracheal intubation was performed by the same co-investigator throughout the study using a cuffed, correctly sized, polyvinyl chloride endotracheal tube that was subsequently connected to a Mapleson F breathing system (infant T-piece breathing system, Intersurgical, United Kingdom). The system delivered isoflurane (Isofor®, Safeline Pharmaceuticals, South Africa) in oxygen via a Tec5 out-of-circuit precision vaporiser (Vetequip, USA) initially set to 2% with a fresh gas flow rate set to 600 mL/kg/min. Spontaneous ventilation was permitted. The overall quality of anaesthetic induction was then scored according to three separate induction criteria as described in Table 1 by the primary investigator. In addition to the scores allocated, total induction doses were calculated per dog and time to induction of anaesthesia was recorded. The target surgical area was aseptically prepared for the orchidectomy, which was performed in a designated theatre by the same specialist surgeon. All anaesthetised dogs were monitored continuously, with heart rate, respiratory rate, oscillometric blood pressure and peripheral oxygen saturation of haemoglobin (SpO2) measured and recorded every 5 minutes. A balanced crystalloid (Ringer's Lactate, Fresenius Kabi, South Africa) was administered intra-operatively at a rate of 10 mL/kg/h for the duration of the anaesthesia. Surgery time was recorded on completion of the orchidectomy, isoflurane and oxygen administration stopped and the dogs moved to a designated recovery area to recover from general anaesthesia. A quality of recovery score was then allocated by the primary and co-investigator (Table 2). Video recording of the entire induction protocol was performed for retrospective analysis by a specialist anaesthetist blinded to the induction agents used. The same induction scoring system (Table 1) was used for the retrospective assessment. The collected data were divided into Group D/K and Group P for comparison and tested for normality using histogram analyses. Parametric data (age, weight, anaesthetic maintenance period, extubation time and time to standing) were analysed for statistical significance using the f-test, while non-parametric data (all scores) were analysed using the Wilcoxon-Mann-Whitney test. A significant level of p < 0.05 was set. Comparison of agreement between the observers was tested using the Kappa Reliability or Kendall Tau B tests (Landis & Koch 1977). No statistically significant differences (p > 0.05) between Group D/K and Group P were observed with regard to age and weight. Additionally, there were no statistically significant differences with regard to cage habitus score, sedation score and duration of anaesthetic maintenance (Table 3). The difference in induction score between the two groups, however, was statistically significant (p = 0.014), as Group D/K had better induction scores depicted by shorter induction times (p= 0.018) and fewer follow-up boli required to achieve endotracheal intubation (Table 3, Figure 1). Clinically, however, both groups produced acceptable anaesthesia, with only seven dogs in Group P and one dog in Group D/K failing to score perfectly (exhibited varying amounts of paddling). The latter was an outlier (inferior score) (Figure 1). No statistically significant differences were observed with regard to intubation score. Group P had a greater incidence of myoclonus than Group D/K (p = 0.003), with nine dogs in Group P (n = 18) observed to have myoclonus. Group D/K had a very low incidence of myoclonus, with only one dog having muscle tremors. There was a statistically significant difference in scores for quality of recovery from anaesthesia between the groups (p= 0.00002) and Group P had significantly superior recoveries when compared with Group D/K (Figure 1). Group-D/K dogs had inferior recoveries from anaesthesia, with 15 of the 18 dogs showing ataxia of varying degrees (7 of the 15 evinced paddling on recovery). One dog in Group P was an outlier on recovery. There was no statistically significant difference in time from termination of isoflurane to extubation of the patients in Group P and Group D/K, but time to standing was significantly shorter in Group P (p = 0.035; Table 3). Clinically, however, both Group P and Group D/K had generally acceptable recovery from anaesthesia. No dogs in Group P and only seven dogs in Group D/K scored higher than 4 and all dogs were able to stand 23 minutes after termination of isoflurane administration. The level of agreement between observers was moderate to substantial (0.40-0.75) in all categories of induction and recovery scoring, barring the intubation score, where Kendall's Tau B test indicated fair agreement (0.32). All dogs were client owned and consent was required in writing prior to being enrolled in the study. The dogs enrolled in the study were exposed to a moderate degree of discomfort as a result of the orchidectomy performed. The surgical procedure was performed by a specialist surgeon and all venepunctures as well as intravenous cannula placement for blood collection and drug administration, respectively, were performed by experienced veterinarians to limit the level of discomfort experienced. Appropriate analgesia including morphine and carprofen were provided during the peri-anaesthetic period. The present study was pre-approved by both the Animal Ethics Committee and the Research Committee of the Faculty of Veterinary Science, University of Pretoria (V017-33). This study demonstrated that Group D/K was associated with better quality of induction and myoclonus scores when compared with Group P. Recovery from anaesthesia was observed to be inferior and of longer duration for Group D/K than for Group P.
The high quality of induction score associated with Group D/K in the present study supports current literature, which describes excitement-free dissociative anaesthesia with sufficient muscle relaxation to permit endotracheal intubation in dogs (Beteg et al. 2010; Hellyer et al. 1991; White et al. 2001). Maintenance of pharyngeal and laryngeal reflexes is expected with dissociative anaesthesia and although difficult endotracheal intubations have been reported previously, adequate doses (diazepam: 0.5 mg/kg - 1.0 mg/kg; ketamine: 5 mg/kg - 10 mg/kg) of both agents as described in the present study facilitated simple endotracheal intubation, favourable intubation scores and short induction times (Haskins et al. 1986; Jackson et al. 2004; White et al. 2001). The observation of inferior quality of induction scores associated with Group P in the present study when compared with Group D/K was surprising and contrary to published literature (Amengual et al. 2013; Bufalari et al. 1998; Hall & Chambers 1987). The present study's design involved the comparison of two commonly used clinical protocols under clinical conditions. Statistically the quality of induction with propofol was inferior to diazepam-ketamine; however, both were clinically acceptable, demonstrating desirable anaesthetic induction characteristics in the majority of dogs anaesthetised. signalment of the dogs that were used in the trial. The propofol dose range described for anaesthetic induction in dogs is wide (Jimenez et al. 2012; Robinson & Borer-Weir 2013). The initial induction dose in the present study (2 mg/kg) reflected the minimum induction dose described by Robinson & Borer-Weir and the mean propofol induction dose observed in the study of 6 mg/kg was comparable to doses reported by Doebeli et al. (2013). The rate of propofol administration may influence the cardiorespiratory system, potentially resulting in hypotension and apnoea if administered rapidly (Keates & Whittem 2012). This was not the case in the present study. Conversely, in the present study propofol was administered at a rate of 2 mg/minute, half the dose rate reported by Bufalari et al. (1998) and Robinson and Borer-Weir et al. (2013). The slow rate of propofol administration may have resulted in partial anaesthetic recovery characterised by paddling, requiring numerous follow-up boli and delayed endotracheal intubation (Branson 2007; Musk et al. 2005; Zoran, Riedsel & Dyer 1993). 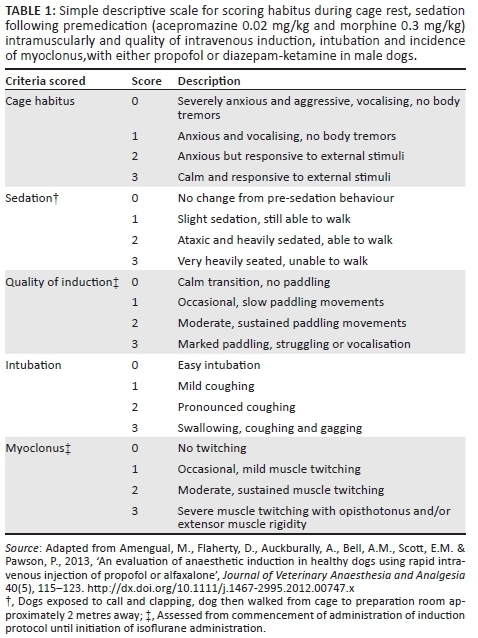 As a result, fair comparison of induction, intubation and myoclonus scores of Group P to Group D/K is limited. Adequate premedication provides anxiolysis, muscle relaxation and analgesia as well as decreasing induction agent dose requirements (Grint, Alderson & Dugdale 2010). Pre-anaesthetic administration of ACP and morphine is commonly utilised in dogs and produces mild to moderate sedation throughout a wide dose range (Brodbelt, Taylor and Stanway 1997; Grint et al. 2010; Henao-Guerrero & Riccó 2014; Heard, Webb & Daniels 1986; Monteiro et al. 2009; Robertson et al. 2001; Smith et al. 2001). The dose of ACP (0.02 mg/kg) and morphine (0.3 mg/kg) used in the present study were conservative and resulted in a light degree of sedation as demonstrated by the low sedation scores. Had there been more pronounced sedation, it is likely that the induction dose as well as the rate of administration used in the propofol group would have been adequate to facilitate easy endotracheal intubation as described by Amengual et al. (2013). In addition, this would have resulted in shorter and excitement-free anaesthetic inductions characterised by less myoclonus (Musk et al. 2005). Timeous endotracheal intubation after induction of anaesthesia with a short-acting induction agent may be challenging, as previously reported in dogs anaesthetised with propofol (Clarke & Hall 1990; Davies 1991). Robinson and Borer-Weir (2013) reported that prolonged intubation times and a greater number of follow-up boli of induction agent were required when intubations were performed by inexperienced personnel. In this study, assessment of anaesthetic depth and subsequent intubation were performed by a relatively inexperienced clinician, potentially contributing to the inferior induction and intubation scores obtained in Group P.
Signalment plays a role in the induction dose requirements in dogs. A study performed by Boveri, Brearley and Dugdale (2013) highlighted the importance of calculating propofol dose requirements based on lean body mass. Body condition score was not assessed during the pre-anaesthetic clinical examination, which is a limitation in the present study as it may have provided a more accurate dose requirement for the dogs induced with propofol. One dog in Group D/K that scored poorly on induction and, similar to an outlier in the study by White et al. (2001), may have been given insufficient pre-anaesthetic sedation. Recovery was statistically superior and shorter in Group P when compared with Group D/K. Historically propofol generally has been associated with acceptable recoveries and the results of the present study further support published literature (Bufalari et al. 1998; Smith et al. 1993; Suarez et al. 2012). One dog in Group P, however, did receive an inferior recovery score, evincing muscle tremors, inability to maintain sternal recumbency and vocalisation. Propofol previously has been associated with myoclonus, paddling and opisthotonus during the recovery period, although vocalisation has not been generally reported (Davies 1991; Robertson et al. 1992; Tsai, Wang & Yeh 2007). Dogs induced with diazepam-ketamine were associated with statistically inferior and prolonged recoveries when compared with propofol. Clinically, however, the quality of anaesthesia was acceptable. Recovery from diazepam-ketamine demonstrated an unremarkable return to consciousness, routine extubation, occasional paddling and vocalisation. Such a recovery, in a clinical setting, is considered acceptable as dogs were not at risk of self-inflicted injury as a result of trauma and most dogs would be able to stand after a relatively short period. Subjectively superior recoveries when compared with the present study's results were described by White et al. (2001) in dogs recovering from anaesthesia induced with diazepam-ketamine and maintained on isoflurane for 103 ± 43 minutes. Compared with that study, the present study had a relatively short duration of anaesthetic maintenance (31.3 ± 8 minutes). The shorter duration may not have provided sufficient time for metabolism and redistribution to significantly decrease the diazepam-ketamine plasma concentration prior to commencement of anaesthetic recovery, resulting in subjectively poorer recovery quality being observed (Jimenez et al. 2012). remarking on the quality of anaesthetic recovery from a specific induction agent without demonstrating the presence of the drug in adequate concentrations in plasma. These arguments raised valid concerns and demonstrate limitations in the present study as well as the study performed by Jiménez ef al. (2012). The results in the present study, however, are still relevant in the clinical setting, where subjectively assessed anaesthetic depth provides the end-point for titration of induction agents prior to intubation. Similarly, the inferior recovery scores consistently associated with diazepam-ketamine during the recovery period in the present study when compared with the near perfect recoveries observed in dogs induced with propofol remain clinically relevant. Separate score allocations for the period prior to extubation (early phase) and the period from extubation to standing (late phase) may have improved the accuracy of evaluating recovery quality and would be useful additions to follow-up research. The present study performed anaesthesia exclusively in healthy, adult male dogs weighing less than 10 kg. Future studies performed in female dogs, juvenile dogs or dogs weighing in excess of 10 kg may yield different results and outcomes. 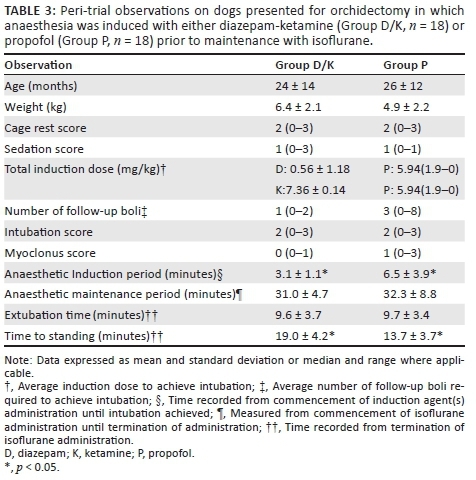 The use of propofol alone and a diazepam-ketamine combination both produced clinically acceptable induction of anaesthesia in the dogs in this study; however, propofol administered at a low dose rate produced measurably inferior induction characteristics. Recovery from anaesthesia induced with both of these protocols was satisfactory; however, recovery from propofol was more rapid and associated with less excitement and ataxia. The funds and necessary infrastructure (facilities, laboratories and equipment) for the present study were provided by the University of Pretoria. Mrs Cilla Trexla is acknowledged for assisting the principal researcher source dogs for the present study. J.P.F. (University of Pretoria) was responsible for designing the study, data collection and writing the manuscript. G.E.Z. (University of Pretoria) assisted with designing the study and writing the manuscript. B.N. (University of Pretoria) performed the orchidectomies and helped write the manuscript. R.B. (University of Pretoria) was responsible for data collection and helped write the manuscript. B.G. (University of Pretoria) was responsible for all statistical analyses and helped design the study. T.B.D. (University of Pretoria) assisted with data collection, study design and with writing the manuscript. L.B. (University of Pretoria) assisted with the study design and writing the manuscript.